HP's cutest PC ever is so adorable I could just eat it up! CES is here, which means a metric ton of PC, and gaming hardware is about to descend upon us. But it's not all about gaming peripherals, new smartphone chips, or curved 4K TV displays. Sometimes, the most interesting news is the cheapest. And in this case, the cutest. 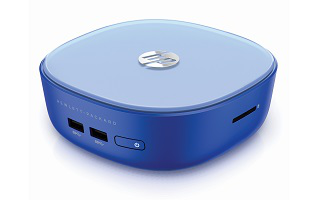 Hewlett-Packard has two new Windows 8.1 PCs coming later this month: The Stream Mini, and Pavilion Mini. The Stream Mini is not only an adorable little machine (seen above), but it's also incredibly cheap, at just $179. Two Benjamins gets you a compact, but fully functional Windows 8.1 box. Inside, you'll find a 1.4 GHz Intel Celeron CPU with integrated graphics, 2 GB of RAM, and 32 GB of flash storage. On the outside, you'll find a chassis that's as cute as a button, along with four USB ports, HDMI, DisplayPort, Ethernet, and an SD card slot. 802.11n WiFi and Bluetooth are also on board. So, look, this isn't a powerhouse of a machine, obviously. But at $200, were you really expecting one? I hope not! But what this machine can do, for those who already own formidable Windows PC hardware, is act as a perfect, cheap little streaming device to bring games to your HDTV. Steam in-home streaming works well enough for single-player games (and some less twitchy multiplayer titles), which means your massive gaming tower can stay in the office, while the Stream Mini lives under your LED TV. And if it acts as a vehicle for Netflix, Amazon, and HBO as well? You're good to go. However, if you want a tad more power in your HTPC, the $319 HP Pavilion Mini might be a better fit. With similar I/O, the Pavilion comes with more powerful CPU options (including Core i3), up to 8 GB of RAM, and a 500 GB hard drive. Look for both mini PCs on January 14th online, along with a February launch in offline retail.